Talk of U.S. manufacturing being in the toilet is shifting—figuratively and, well, also literally. I never would have realized how fiercely competitive the toilet-making industry is were it not for a report I read in The Wall Street Journal a few weeks ago. Apparently U.S. manufacturing of toilets is surging, though for the most part under foreign ownership of brands as apple pie as American Standard. Nonetheless, this is a positive manufacturing headline amidst years of gloom. “The toilet turnaround is a microcosm of U.S. manufacturing trends,” the Journal touted; and others agree that manufacturing in this country is on the uptick. The evidence, especially during the past few months, is pointing to it. Output from factories is rising and there are strong gains in manufacturing production. Lower labor costs are also making American workers more attractive. Add to that a natural gas boom that many hope will lower energy costs for manufacturers and the picture gets rosy. But others say that those indicators are fool’s gold, since these signs may be more a virtue of an overall economic recovery than a manufacturing revival. Time will tell. 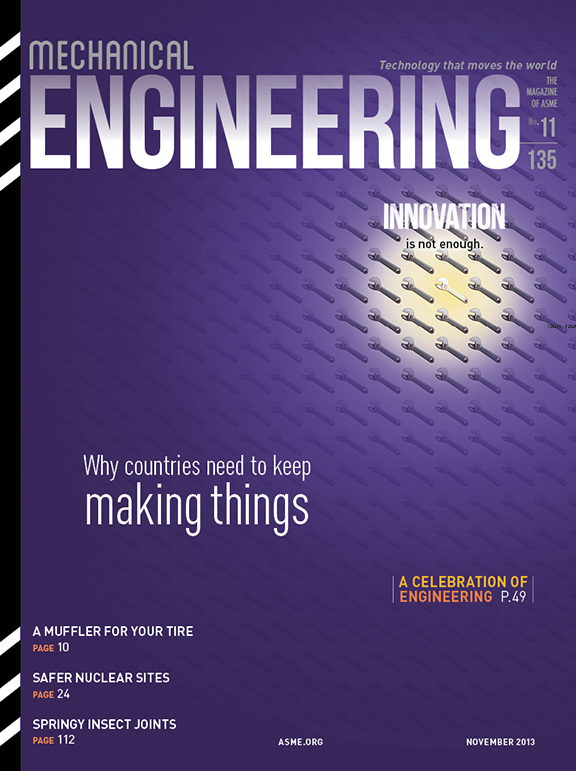 In this special issue of Mechanical Engineering we talk a lot about U.S. manufacturing, but we aim to celebrate manufacturing globally since new technologies are eliminating many obstacles to doing business across borders. Specifically, we want to give a nod to those who are finding new ways to manufacture existing products and those who are manufacturing new products using advanced technologies. These processes come under the burgeoning term, “advanced manufacturing”—which is also the theme of this month’s ASME International Mechanical Engineering Congress and Exposition in San Diego, Calif. In this issue—one of the largest in terms of pages we’ve had in some time—we also celebrate some of the heroes of engineering who will be saluted at the 2013 Honors Assembly, which will also be held at the ASME Congress. These are individuals whose drive to change the world is consistent and noteworthy. Among them is G. Wayne Clough, the Secretary of the Smithsonian Institution in Washington, D.C., and Arun Majumdar, who is driving Google.org’s energy sector and is the former founding director of ARPA-E, the U.S. Department of Energy’s Advanced Research Projects Agency. There, Majumdar evaluated high-risk, high-reward technologies including advanced manufacturing methods that offer a different approach to traditional technologies. A full listing of the past year’s honors recipients begins on page 49. We also pay tribute this month to the 140 ASME members who have been newly named Fellows of ASME. To learn more about them, see page 65. Also this month we bring you something different, the premier issue of DEMAND, ASME’s global development review. DEMAND was developed through ASME’s Engineering for Global Development initiative in collaboration with Mechanical Engineering. This publication showcases the work of individuals and organizations working at the intersection of technology and global development. DEMAND includes carefully selected case studies written by social innovators who aim to stimulate the search for solutions that are in demand on the ground in developing countries. Today’s practitioners in the developing world toil in untraditional approaches, as do those who use advanced technologies to push the boundaries of manufacturing. At the heart of it is a drive to change the status quo—and improve how people live.